Tenochtitlan was the capital city of the Aztec Empire. The Aztecs built Tenochtitlan around 1325, right on a lake called Lake Texcoco. As the Empire grew, so did Tenochtitlan. By the early 1500s, at least 200,000 people lived in the city. This made Tenochtitlan the largest city in the Americas before Christopher Columbus arrived. 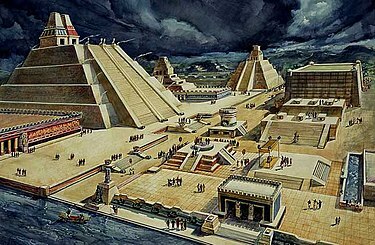 Tenochtitlan was the center of the Aztec government and religion. It was also a very big trading center. When the Spanish arrived in 1519, they guessed that 60,000 people came to the market in Tenochtitlan every day. People bought and sold many things there, including slaves (prisoners of war from states the Aztecs had taken over). The entire city was decorated with art, architecture, and stone sculptures. The city had a huge pyramid called the Templo Mayor (Great Temple). At the top of the Temple, there were two small rooms. In these rooms, the Aztecs sacrificed people to two of their most important gods: Huitzilopochtli, the god of war and the sun, and Tlaloc, the rain god. The Aztecs believed that if they did not feed their gods blood, the gods would wither and die, causing the end of the world as they knew it. The Aztecs also built chinampas (small rectangular crops floating on lake beds) so that they could create more food to feed the thousands of people who lived around Tenochtitlan. In addition, they built waterways and dams so that they could receive fresh water, and block out the salty brackish water. In 1519, Spanish conquistadores led by Hernan Cortes arrived in Tenochtitlan. Cortes was impressed with the city, but still decided to attack it. The Spanish and their Tlaxcalan allies invaded Tenochtitlan, and the city fell in 1521. Mexico City was built over the ruins of Tenochtitlan. Model of the Aztec "Great Temple"
↑ In 2015, archaeologists found what was left of a water tunnel coming from the Aztec Great Temple. Historians know that after Aztec rulers died, the Aztecs cremated them. However, they have never known where the Aztecs buried their rulers' ashes. Archaeologists think this tunnel led to the place where the Aztecs buried the ashes. Mexico remade the tunnel with bricks, and it is now a monument. ↑ Marty, Lisa (2006). Ancient Aztecs. Lorenz Educational Press. p. 9. ISBN 978-0787783259. ↑ 3.0 3.1 "Central and South American Empires: 11d. The Aztec World". Ancient Civilizations Online Textbook. The Independence Hall Association. 2014. Retrieved April 17, 2016. ↑ Cartwright, Mark (February 26, 2014). "Aztec Civilization". Ancient History Encyclopedia. Ancient History Encyclopedia Limited. Retrieved April 17, 2016. ↑ Brodd, Jeffrey (2009). World Religions: A Voyage of Discovery. Saint Mary’s Press. p. 32-36. ISBN 978-0884899976. ↑ West, Robert C.; & Armillas, Pedro (1950). "Las chinampas de México" (in Spanish). Cuadernos Mexicanos 40: 165-82. ↑ Cline, S.L. (1986). Colonial Culhuacan, 1580-1600: A Social History of an Aztec Town. Albuquerque: University of New Mexico Press. pp. 2-3. ISBN 978-1597406642.